Discover North Carolina’s top three big bass freshwater fishing lakes — Falls Lake, Jordan Lake, and Shearon Harris Lake with Outdoor Expeditions USA guided bass fishing trips. Anglers of all experience levels will enjoy time on the waters near Raleigh, NC. Falls Lake was built by the U.S. Army Corp. of Engineers and completed in 1983. Falls is fed by major tributaries that include Little, Eno and Flat rivers, as well as New Light, Ledge and Lick creeks. Normal pool is 251.5 ft. above sea level. Hundreds of laydowns and patches of standing timber are found throughout the lake. Submerged roadbeds, islands and creek channel drops are key structural features. Falls offers great fishing year round with February, March and April being the best months of the year to catch a true trophy largemouth. 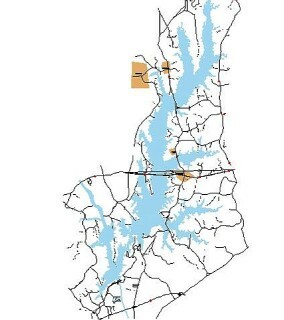 Falls lake covers 12,400 acres and has 230 miles of undeveloped shoreline. 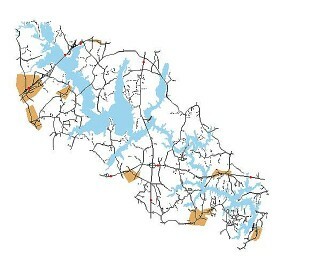 Jordan Lake was also built by the U.S. Army Corp. of Engineers and was completed in 1981. Major tributaries are Haw and New Hope Rivers, as well as Beaver, Little Beaver, Morgan and White Oak creeks. Normal pool is 216 ft. above sea level. Jordan covers 13,900 acres and offers great fishing year round. February, March and April offer the best opportunity for double digit largemouth. Creek channel drops, roadbeds, standing timber and laydowns all hold nice largemouth. Hybrid bass are also abundant in Jordan Lake. 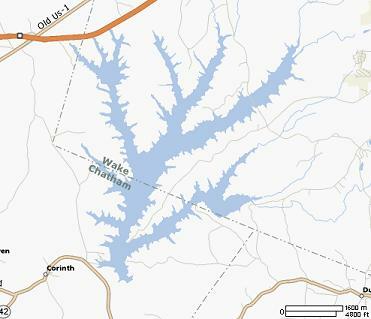 Shearon Harris Lake is owned by Duke/Progress Energy and is 4100 acres in size. Though it’s considerably smaller than it’s neighboring lakes and full of aquatic vegetation, Harris produces double digit bass every year. It is considered North Carolina’s #1 trophy bass fishery. Bass can be caught a variety of ways on Harris. Key structural features are roadbeds, creek channel drops, and points.